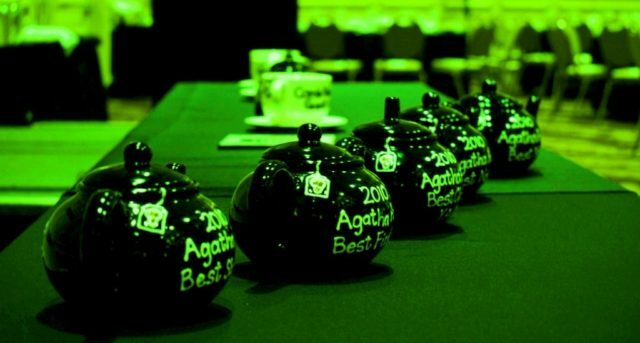 Congratulations to Art Taylor who won the Agatha Award at last night's Malice Domestic banquet. The prize was for "Parallel Play," hist story in Chesapeake Crimes: Storm Warnings. 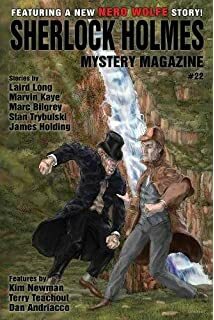 "A Clown at Midnight," by Marc Bilgrey, in Sherlock Holmes Mystery Magazine, #22. 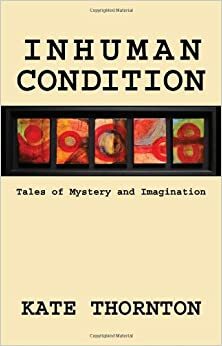 I have talked before about the characteristics my favorite stories tend to have in common. One is "heightened language," by which I mean that the words do something more than just get you from the beginning to the end of the tale. Usually that means high-falutin' talk, but in this case, it is the flat, declarative sentences that Bilgrey uses to ground us in a bizarre tale. Jack dreams of a creepy clown. He has done it all his life: a recurring nightmare of a clown who chases him and tries to strangle him. This has ruined his life, destroying his sleep, which loses him jobs, ruins relationships, etc. Various treatments have been no help at all. A friend suggests a hypnotist who helps him find the root of the problem: an actual assault when he was seven. With some clever research he figures out who that clown had been. Now, what to do about it? Congratulations to Larry Block who receive dthe Edgar for Best Short Story tonight. "Double Slay," by Joseph D'Agnese, in Mystery Weekly Magazine, April 2017. For some reason suspense and humor go very well together. Ask Alfred Hitchcock or my friend Joseph D'Agnese. This story is about Stan and Candace, a cheerful retired couple traveling through Canada towards Alaska. They pick up a hitchhiker who informs them that he is a serial killer. "Game, Set, Match," by Zoe Burke in Bound by Mystery, edited by Diane D. DiBiase, Poisoned Pen Press, 2017. Macy Evans is a middle-aged woman who has just been kidnapped by a younger man. He has locked her in his basement and his plans for her future seem vague, or rather changeable. They seem to involve his wife and Macy's husband, and one or more persons leaving this mortal coil. And you can bet that will happen. This story has a sizeable plot hole (unless I am missing something). But I liked the style and suspense. Bleak Future, by MItch Alderman. 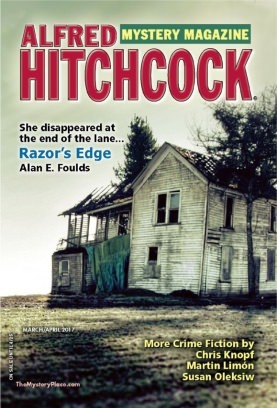 "Bleak Future," by Mitch Alderman, in Alfred Hitchcock's Mystery Magazine, March/April 2017. His client this time is a wealthy heavy equipment dealer named Hank Langborn, who is dying of cancer. "I've been putting my ducks in a row before flying south for the long winter." Someone is threatening Hank's grandchildren and he wants Bubba to find the bad guy. Bubba is afraid if he does Hank will kill the villain. What does a dying man have to lose? There are surprises in store, both in terms of the bad guy's identity and how the case is resolved. Bubba is always an enjoyable comanion. "Just Like In The Movies," by Kate Thornton, in Inhuman Condition, Denouement Press, 2010. The author gave me this book two years ago and I have been shamefully slow about getting around to reading it. Are you familiar with cryptic crosswords? These are popular in England; never caught on much here. Each clue is a puzzle in itself. Wikipedia gives the example of: Very sad unfinished story about rising smoke (8) which is a clue for the word "Tragical." Go to the article if you want to see how that works. It baffles me. Which has nothing to do with Thornton's story, but have faith. We will get there. Years ago I read about one of the famous setters (i.e. creators) of cryptic crosswords who created a puzzle in which the first clue could lead to two possible answers, one correct and one almost correct. Whichever of those you chose you could answer all the clues successfully - until the very last one. If you started down the wrong path, you wound up with one one final clue you could not answer. And that almost brings us to Thornton's story. The narrator is a teenage girl who compares herself to Jimmy Stewart in Rear Window. She has been watching a lot of movies because she can't leave the house. Not because of a broken leg like Jimmy, but because of a monitoring device on her ankle. Seems she brought a knife to school for protection, and they accused her of some other stuff she denies. At one point in the story there is a sentence that can be read two ways, just like that first cryptic crossword clue, and if you interpret it the wrong way (trust me, you will), Thornton will lead you merrily in the wrong direction. And that's a very enjoyable trip. The Short Mystery Fiction Society has announced the finalists for the 2017 Derringer Awards. The members will vote this minth and the winners will be announced in May. Congrats to all!